I generally don’t prefer to have a separate small partition at the beginning of my hard drive so here is how to prevent Windows 7 from creating hidden or recovery partition. Note: This procedure is applicable only if you are doing a clean install on hard disk that contains unallocated space. Doing this procedure in a hard disk that already contains data will cause data loss. 1. In this case we are going to install the Windows 7 in a hard disk of 30GB capacity i.e with 30720MB. 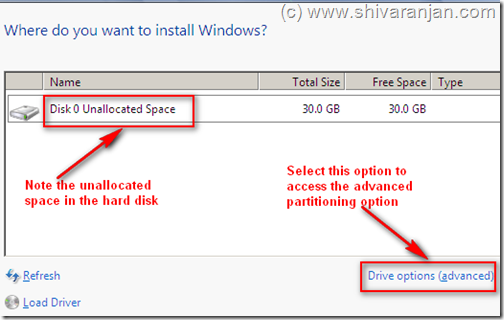 When the partitioning screen is encountered select the Drive options (advanced) to access the partitioning options. 2. Now using the ‘New’ button try to create a partition. Enter the partition size that you intend to create and apply the settings. 3. Now Windows 7 will prompt a message that reads “To ensure that all Windows features work correctly, Windows might create additional partitions for system files”. Click the OK button, now you will see there are two partitions one is of 100MB in size and other is with 29.9GB in size. 4. Now delete the bigger or second partition using the delete the button option. After the second partition is deleted it will again go to unallocated state again. 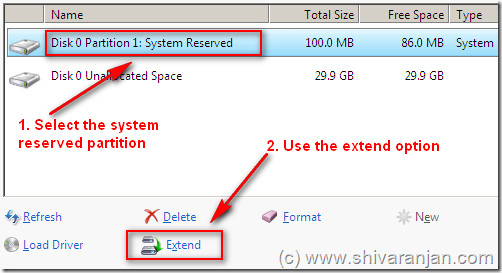 In the extend option enter the partition size of the your choice. Say if you have a 30GB hard disk and wish to have a partition of 20GB and 10GB then enter 20GB and click apply. This will now create a partition of 20GB and remaining 10GB will be in unallocated status. Again use the ‘New’ option to create a partition of 10GB, your partition should look like this. In case of any questions please post it in comment section. can to this while creating 2 or 3 partitions? Getting a advance loan payday loan is not too much difficult for an employed person. You will find that this also improves your overall rating in the bargain. Why not tell everyone else *WHY* it’s good to have/skip the recovery partition? We might want to skip it also… but it’s impossible for anyone find out WHY, from your article. website; this website contains awesome and in fact excellent data designed for visitors. spelling problems and I to find it very troublesome to tell the truth then again I will surely come back again. Thanks for finally talking about >How to Prevent Windows 7 from Creating a Hidden /Recovery /System Reserved Partition during Installation <Loved it! of the massive popularity of the English Premier League in England. that you shouldn’t bet with emotion. I am having problems needing to resize / increase system reserve to allow for the creation of a system image. WOW, I stumble across a con man telling other folks to delete it…NOT telling them they will not have a way to create system images along with other helpful diags…..READERS BEWARE of self taught, non techs giving advise!!!! Hello,I read your blogs named “How to Prevent Windows 7 from Creating a Hidden /Recovery /System Reserved Partition during Installation” regularly.Your writing style is awesome, keep it up! And you can look our website about proxy list. Exploring inn Yahoo I finally stumbled upon this site. Glance advanced to far delivered agreeable from you! By the way, how can we keep in touch? jetzt, wie ich bin ein Benutzer der Innternet so ab sofort Ich bin mit Netz für Artikel dank Web. in the future. I want to encourage you tto continue your great posts, have a nice morning! say that this write-up very pressured me tto take a look at and doo it! contains windows 7 from creating hidden recovery system reserved. Can The Windows 7 System Reserved Partition Be Deleted Without Problems? | Click & Find Answer ! Можно ли без проблем удалить системный зарезервированный раздел Windows 7?